For nectarine relish, heat oil in a large saucepan over medium-high heat, add onion, garlic and fennel seeds and stir occasionally until tender (4-5 minutes). Add remaining ingredients, season to taste, bring to the simmer, reduce heat to medium and stir occasionally until thick and jammy (15-20 minutes). Transfer to a sterilised container and refrigerate to pickle before using (2 days). Makes about 500ml. Nectarine relish will keep refrigerated for 1 month. 2.Preheat oven to 220C. Place pork belly skin-side up on a work surface and score skin in a cross-hatch pattern. Combine rosemary, garlic, pepper and fennel seeds with half the sea salt in a bowl then spread evenly over pork belly. Drizzle skin with oil and scatter with remaining sea salt, massaging into the incisions. Place in a roasting pan, add wine, roast until crackling starts to form (30-40 minutes), reduce temperature to 160C and roast until cooked through (1 hour). Rest for 20 minutes then thickly slice. 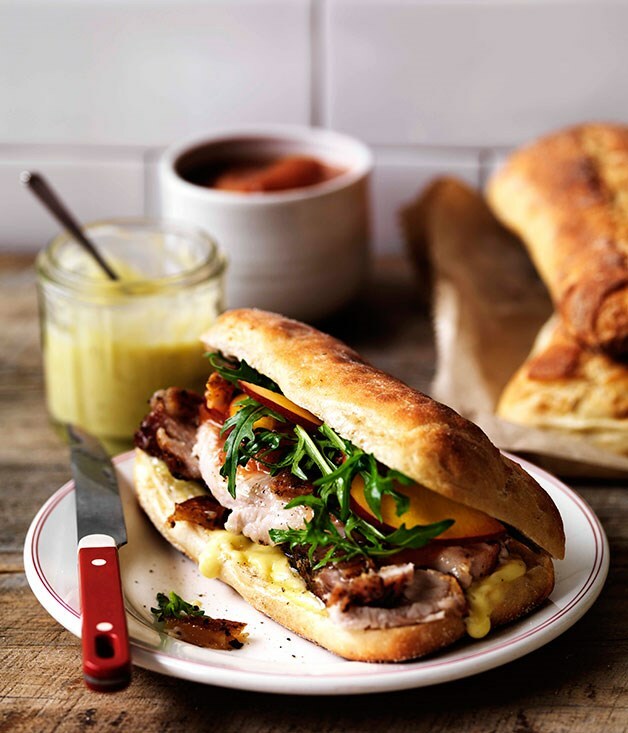 3.Spread ciabatta rolls with aïoli and nectarine relish, top with pork, crackling, rocket and nectarine slices and serve.